Ranked #11 in Tom Vasel’s Top 100 Games of All Time! Designer Uwe Rosenberg (Agricola, Caverna, Bohnanza, etc) has helped us combine the second edition of Viticulture with a few elements from Tuscany: Mama & Papas, Fields (Properties), various Visitor cards, & Automa (solo variant). This is basically a more robust version of Viticulture without adding the complexity of some of the “heavier” Tuscany expansions. Mamas & Papas gives players different starting resources. Field cards let you sell fields you’re not using for an influx of money. A larger set of visitor cards offer a lot more variety, and we’ve selected only the most balanced cards so there’s never a bad draw. These are the expansions we always play with–they no longer feel like expansions. So they’re now included in the core game of Viticulture. 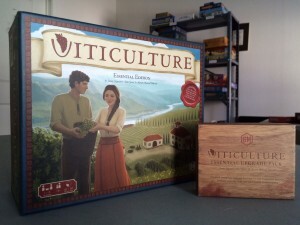 The Viticulture Essential Edition is available from retailers and on our website, along with the Viticulture Essential Upgrade Pack. Aesthetically, the box art is slightly different and the rulebook is more detailed (it’s on our website in case you want to download and print it). Otherwise everything is the same as the second edition (tons of custom wooden components and glass beads). The game board is slightly different in that the “Buy/Sell Grapes” action now reads “Sell at Least One Grape or Buy/Sell One Field.” The Essential Edition also includes 36 Mama & Papa cards (these determine your starting resources–you no longer start with anything else by default), 18 Field cards (previously known as “Properties”), and 24 Automa cards (solo variant). The 76 visitor cards in the Essential Edition can be downloaded here or seen in list format here. These cards replace the original, advanced, and new visitors found in Viticulture and Tuscany. The Promoter card has a slight word change (“and” changed to “or”), as does the Homesteader card ($3 discount instead of $1). You may only gain the 1 VP bonus from the tasting room if you have at least 1 wine token in your cellar. You don’t lose the token–it just has to be there so your guests have wine to taste. If you want to update your vineyard mats with this notation, here are printable stickers. There is no maximum score (previously, 25 VP was the maximum in the core game). The Viticulture Essential Edition contains 154 cards at the 44 x 67 mm size and 78 cards at the 63 x 88 mm size. 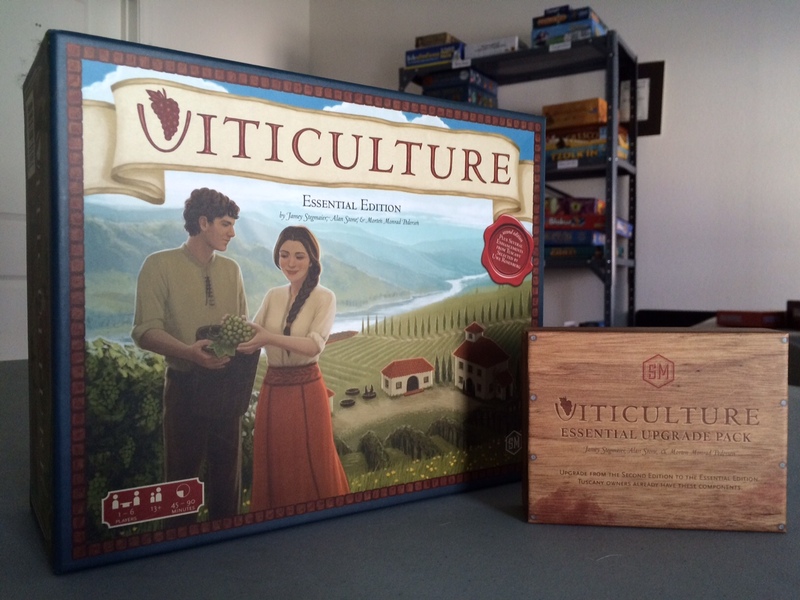 The Essential Upgrade Pack turns the second edition of Viticulture into the Essential Edition. Statistics, insights, and lessons learned from the pre-order campaign (September 1-15, 2015) can be found here.